Do you have any interest in learning to paint? This class offered at Unity Christian Music Festival will allow participants to have a guided 1-1/2 hour class to create a Master Piece. 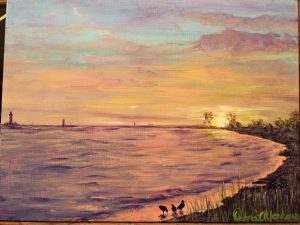 Deb Yonkers, a local artists from Muskegon, will walk you through this great individual or group activity! There are two 90 minute sessions on Thursday, Friday and Saturday at Heritage Landing during Unity Christian Music Festival. The cost for this 90 minute session is just $25 (in addition to your Unity ticket). Prices increase to $30 the day of the event. Space is limited to 12 painters per session. Be sure to reserve your slot in the event by registering online. Use this link to buy your tickets online now to reserve your space. On-site registration will only be available if space allows and the price will be higher. Painting #1 “Country Roads Take Me Home” – completed during 4:00 p.m. sessions on Thursday, Friday and Saturday. Painting #2 “Joy of the Moment” – completed during 2:00 p.m. sessions on Thursday, Friday and Saturday. Experience: Directly in the Art business for the last 22 years. She has been a fine art’s dealer, professional framer as well as a drawing and color teacher. Presently: She is combining painting, doodles and healing by encouraging others to discover their Hope, Identity, Purpose and Truth in Christ so they can be all they were created to be. 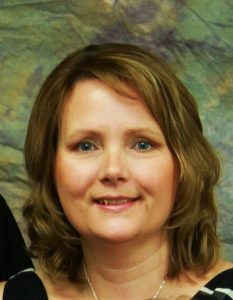 She is the director of both Empowered Kids and Spiritual Care Consultants. 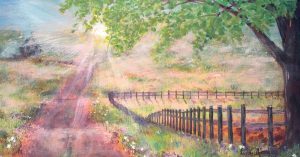 Recently, she has developed creative ways to work through hurts and encourage God’s truth using fine art, some of which you’ll enjoy during her class. She defines her purpose as teaching others to enjoy God’s gifts and presence in all things by combining painted expressions with scripture and God’s creation. Use this link to register now and reserve your space.